The evolution of light bulbs has been seriously testing my green credentials as incandescent bulbs are phased out. I'm all for saving energy and always have been but the aesthetics of the low energy long life bulb have been a problem for decorative lighting. You cant really stick big chunks of white plastic in antique chandeliers for instance. Lamps with shades are not a problem, it's where you see the bulb that it is. 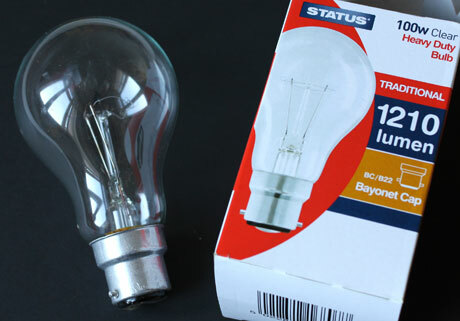 You can still buy clear 100 watt bulbs (pictured above) but they're designated for "rough service" not domestic - interesting - I definitely need one of these in my studio where I really have to see what I'm doing, it is the only one I will use. You can read more on this here and facts here. Otherwise these halogen bulbs are replacing golf and candle bulbs and are becoming more readily available. You can see the filament bit is different to the classic outlawed style and it is brighter - more concentrated - so it's not comfortable to look directly into. These save about 30% energy. They may well make a twisted candle one which will replace what I've been using in my Teacup chandeliers. LED candle bulbs are pricey and not up to scratch yet, I've been watching bulbs for years and waiting for the technology and aesthetics to improve and I'm sure LED's will be better in just a few years. 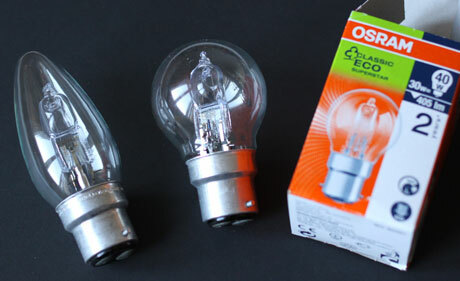 Incidentally alot of these bulbs are not as green as you think, the carbon footprint of producing them (in the far east) can be high and is anyone really disposing of the CFL's (compact fluorescent lights) properly as they have mercury in them? So there's alot more change needed ahead. These lovely filament bulbs will not be permitted to be manufactured anymore - though they are long life bulbs - you can still buy existing stock, there's a great selection here from Historic Lighting and it's made in Switzerland. 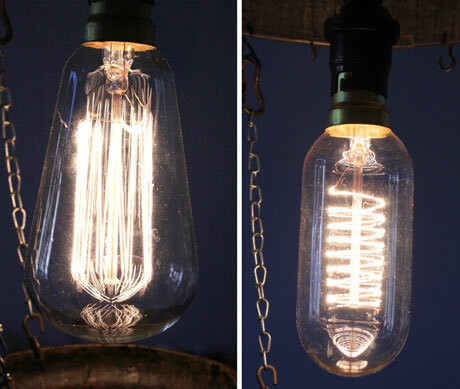 You see these alot in trendy bars, the one on the left is called a squirrel cage filament - terrible name!! - but I love the bulb shape. I wonder if it's going to be possible to one day produce something that looks like this but uses less energy, I hope so.